Lots of the postcards represented in the collection are seasonal, whether they’re depicting a once-a-year festival, a product that is harvested during a certain time, or flowers that have a growing season. Some have general seasonality, or don’t have anything specific that gives me a time period to say one season or another, but I’d say the majority of cards do. But what surprises me about the collection is that only one postcard features what I consider to be one of the highlights of Japan: fall colors, called “kouyou” here. Just one! Okay, I know the cherry blossoms are better known (and you can bet I’ll be having a posting ball with that once spring comes), but I’d think the fall colors would have a little bit more representation! 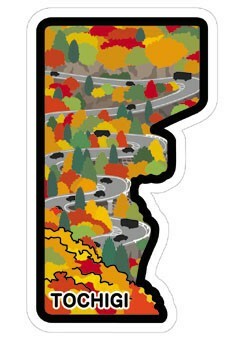 So the one card that depicts the beautiful reds, oranges, yellows, and fading greens of fall is Tochigi’s sixth and most recent postcard showing the winding road of the Irohazaka in famous Nikko. 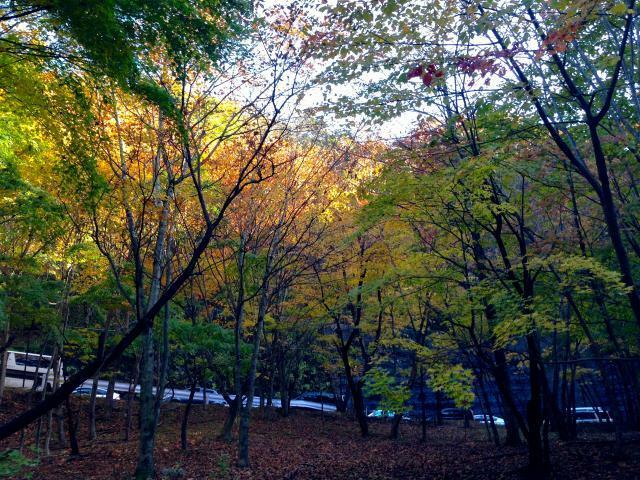 The two roads that make up the Irohazaka connect lower Nikko with the higher elevated Okunikko, and have a fabulous and fun 48 hairpin turns together, hence the name “Iroha” which comes from the name of the Japanese alphabet which has 48 characters plus “zaka” for slope. I have mostly videos of the crowds on the up road, this is the only picture, but those cars are stopped. Beautiful colors on the way down! 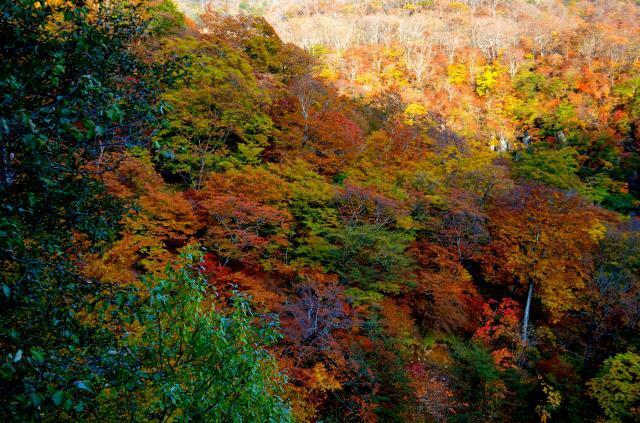 By the way, I would wholly recommend going to Nikko during the fall colors, but not on a weekend as the Irohazaka can get unbelievably backed up. If you must go, try to go up as early as possible; down’s usually not as bad. You can read more about the Irohazaka over at Japan Guide here, as well as the most recent report of the color status at Nikko here. Colors are early this year, so go soon if you’re going! 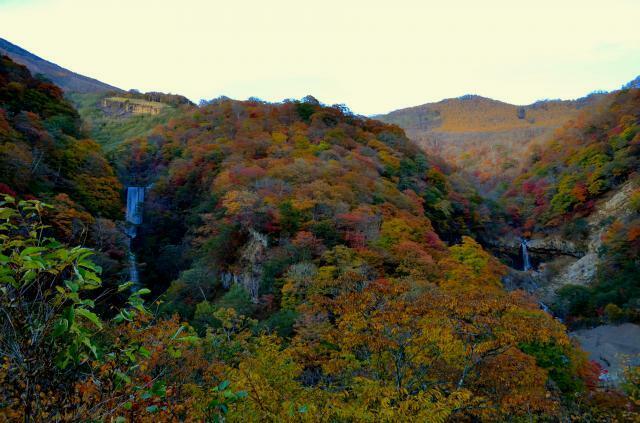 This entry was posted in Date: 2014 - Set 6, Prefecture: Tochigi, Type: Place and tagged fall, fall colors, gotochi, irohazaka, kouyou, nikko, okunikko, postacollect, tochigi by postacollect. Bookmark the permalink.